Looking for a job you can believe in? And a job that believes in you? We are always looking for fun, energetic and eager individuals to add to our team. Please fill out this brief form and we'll be in touch. Please select which department you are applying for. Please list your last three jobs, most recent first, with dates of employment. Please tell us your three favorite restaurants and why you love them. Tell us what you do outside of work, and about your education. 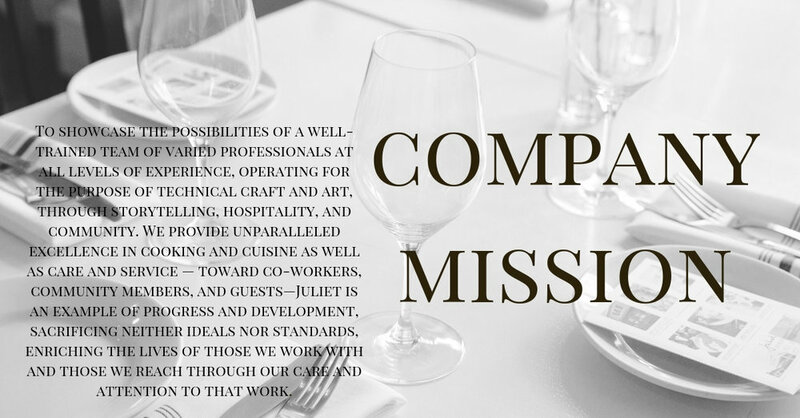 Why is Juliet the place for you? What do you know about us? How did you find us? We haven't asked but you want us to know....? Well, anyone. We are a small team, and exactly what you think you are applying for may not be available at this time. But anyone who is interested in our way of work is encouraged to get in touch. Students, career changers, and those with limited experience should feel especially encouraged to apply. While there is unfortunately not room for everyone on the team, those who can join us will find a comprehensive and consistent training program, a supportive environment, and a values driven team that rewards dedication to craft, details, and continued learning.